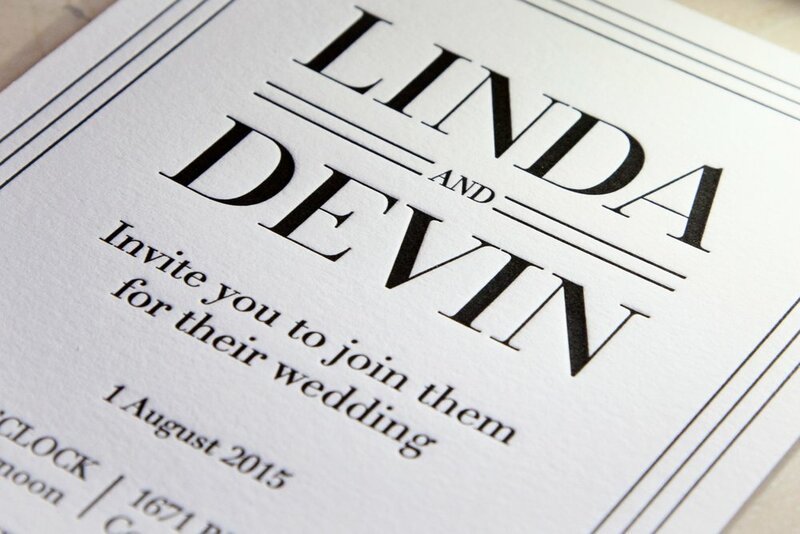 Towne Press is a bespoke design and letterpress studio specializing in custom wedding invitations. You are unique, and your wedding should be too, right down to the invitations. They set the stage for your event. 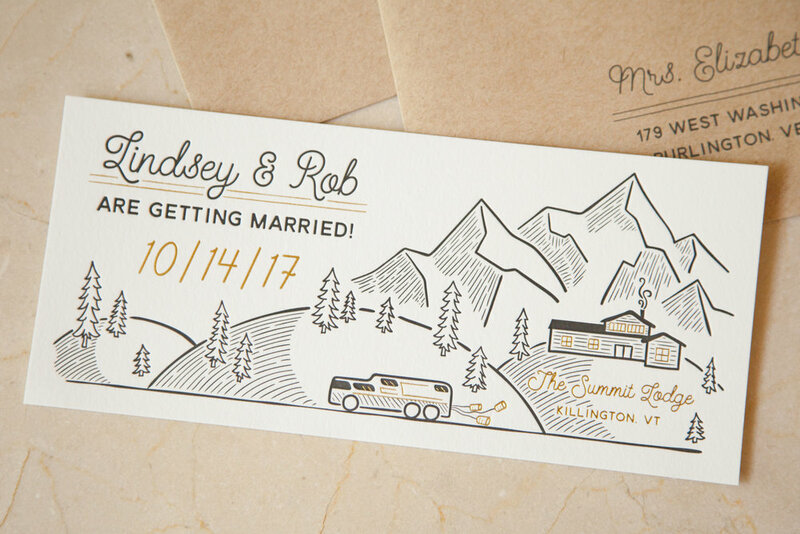 Whether it’s elegant, rustic, classic, or vintage, Towne Press will work with you to design the perfect invitation, tailored to you and your big day. 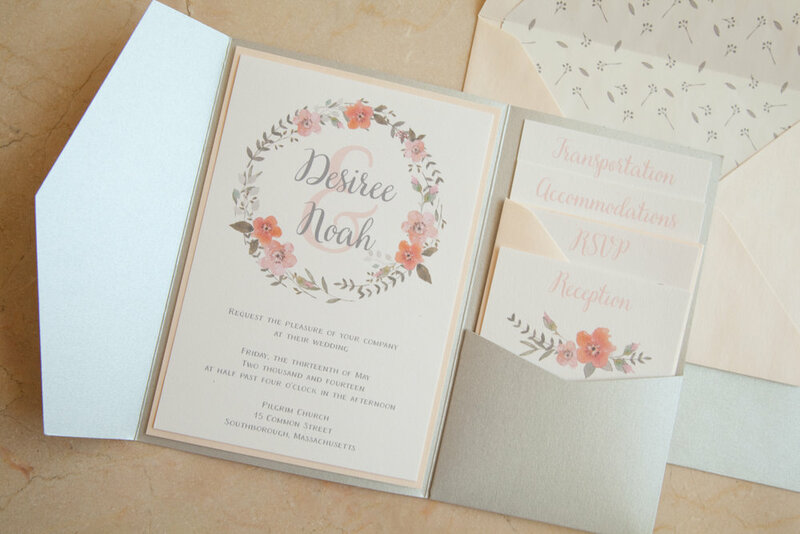 We will also help you coordinate the entire wedding invitation suite: pocket invitations, petal folds, mats, envelopes, envelope liners, custom wraps, twine, lace, ribbon... you name it! 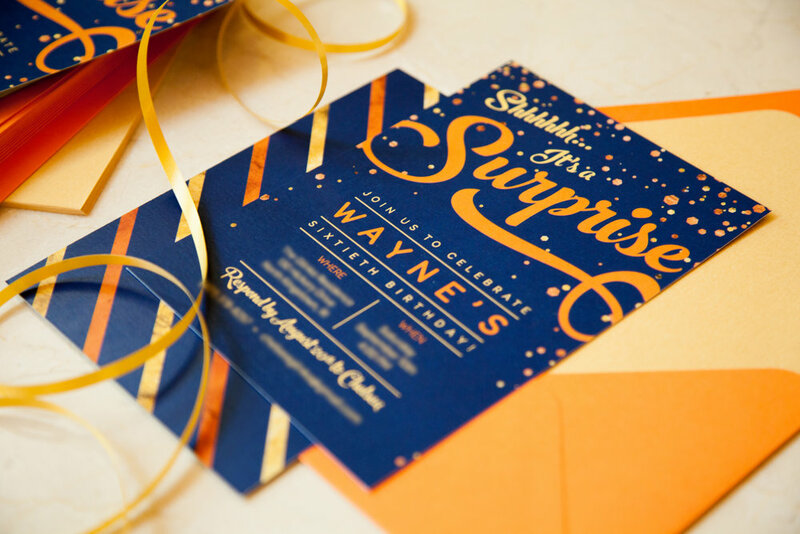 We can accommodate whatever you come up with, and make your invitation dreams come true! Let's talk! Whether in person, on the phone, or via email, I want to hear all about your vision for your dream invitations. Feel free to send me examples or a link to your pinterest page to help me understand your personal style. I have several options for you to choose from to construct your perfect invitation. You will pick your colors, package, paper, and printing method. If you need any help deciding I'm always happy to make recommendations. I will send you a formal quote detailing exactly what you will be getting and how much it will cost, along with the expected time line. After I receive a 50% deposit, I will begin designing your custom invitations. With the business stuff out of the way, we can get on to the fun part! I will take all the ideas we talked about during our consultation and incorporate them into a beautiful, cohesive, one-of-a-kind design. After the first draft of your invitation is complete, I will send a proof for your approval. Make any changes you would like. Once we've settled on the invitation design, I will build out the rest of the suite. Once your design is approved, it will go to press. For digitally printed invitations, I can send you a printed proof. Unfortunately, I cannot provide printed proofs for letterpress or foil stamped jobs. Invitations, mats, envelope liners, monograms, etc. can be professionally applied before they are shipped to you, but if you need to save a little money, that can easily be done by you or your bridesmaids. Once your invitations are complete, all you have to do is sit back and admire them. Oh, and mail them to your guests, of course, but I recommend you keep a couple copies for yourself too! I use only the finest papers and heavy weight card stocks. With over 80 colors to choose from, you are bound to find the right combination to match your event. Want to see how your envelope, liner, and invitation will look and feel? Feel free to contact me for samples! 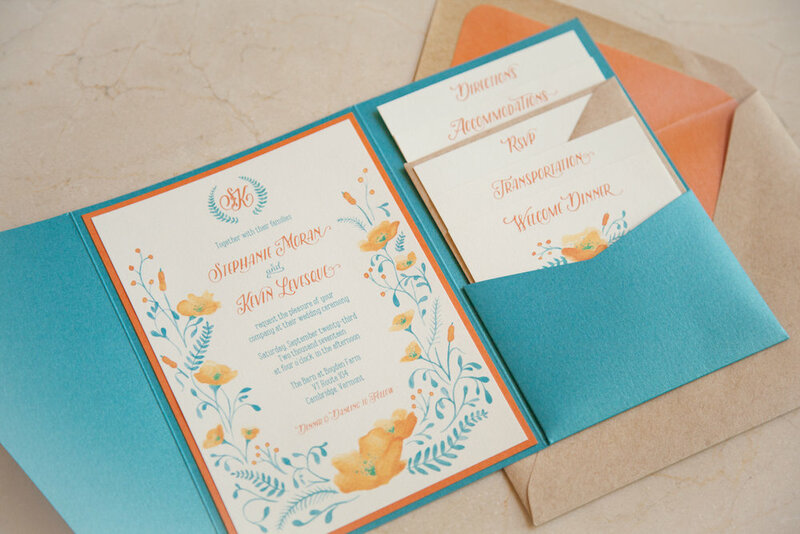 Choosing the right printing process really showcases your wedding's style. The method of printing will also affect your budget, dictate your paper choices, and impact the design. To help you decide which printing method is right for you, read on to learn more about each of them. Both quick and economical, digital printing can be used to convey just about any style. The paper will be a bit thinner than letterpress or foil stamping, but still heavy enough to feel substantial when handled. Because there are no plates or screens, your design can incorporate absolutely any color, and the production quality is high enough to support even the most delicate or complex designs. Digital printing offers the fastest turnaround time, and typically winds up being less expensive than the other options. Don't mistake affordable for simple, though, you can achieve truly beautiful results with this very easy process! Letterpress is typically considered a more traditional, formal printing process, and it certainly makes an impression! Your design will be etched in reverse onto a printing plate. The plate is then inked and pressed into the paper, leaving a crisp, deep imprint. While letterpress is a bit more expensive, you can keep costs in check by limiting your color pallette, as each color is applied individually requiring as many plates as there are colors in your design. Letterpress makes for a very special final product. The depth of the print and finer texture of the heavier paperstock creates a level of sophistication unique to this beautiful process. 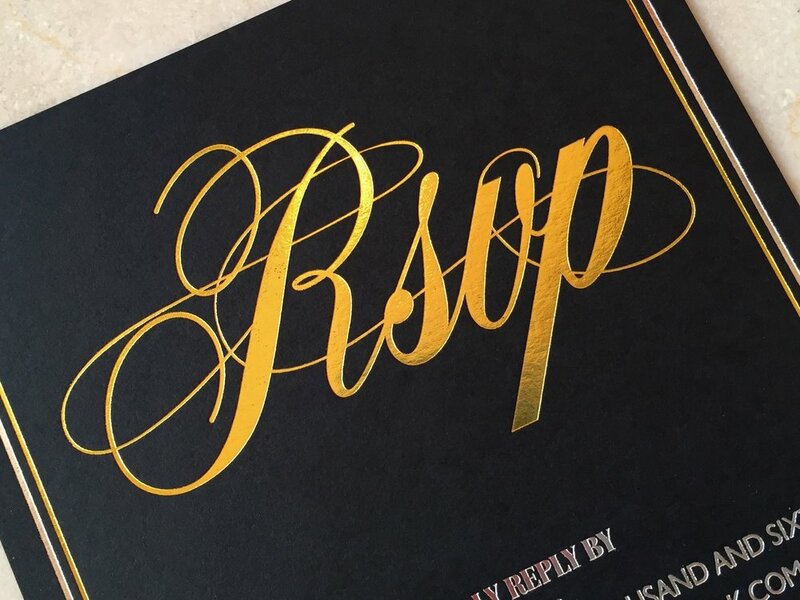 Foil Stamping can turn your beautiful invitation into a luxurious, elegant work of art. Your design will be carved into a copper plate which is then pressed into a thin sheet of metal foil that imprints and adheres to your paper. Think letterpress meets luster. The moment your invitation slips out of its envelope and into the light, it will catch everyone's eye. Foil stamping is the most expensive option available, but there's nothing else quite like it.